I was really excited to be contacted by HairPomades.com at work this week – their marketing material is such a breath of fresh air! 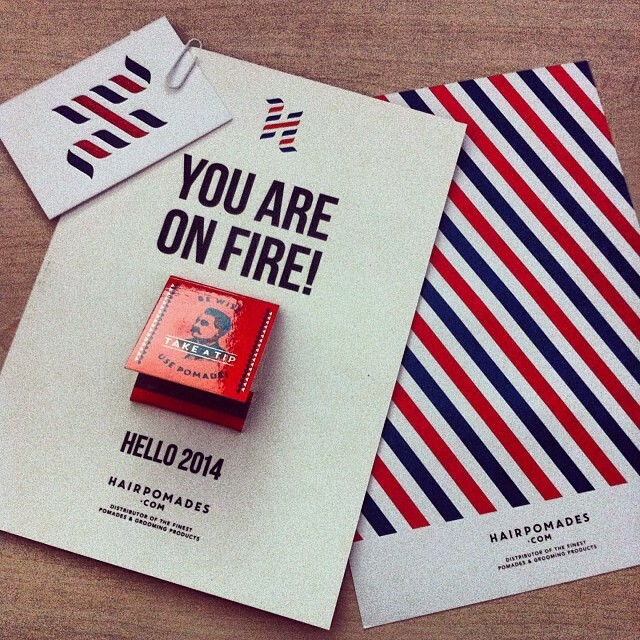 Cute little box of matches (which is part of a bigger social campaign that you can see here) and a nice reworking of classic barber pole colours for something entirely modern. That was exciting enough (it was the first Monday back after Christmas, give me a break), but then I actually clicked through to the website and was equally impressed at the stock on offer. Much like the feeling I get when venturing into a fancy French pharmacy or going wild in the aisles at Walgreens when I’m on a work trip to the States, I just wanted to look at EVERYTHING. Sure, it’s all for barbers (and professionals at that), but all of the products look so appealing that I just want to stock up on the lot. And then display them proudly in my bathroom. All of the brands that HairPomades stock are super-desirable – and hard to track down in the UK, in my experience. Murray’s is Andy’s favourite pomade from the States and I can never find it in England, while Blue Magic, Layrite (teehee) and Royal Crown are all new to me, but tick that same kitsch Americana box. Lucky 13 offers something different with its flash-inspired artwork, but again it has real shelf-appeal. On a more contemporary design tip, Oak and Dr K are also new to me – but equally interesting and stylish. How much more impressive would that be on a bathroom shelf than a sad tin of Gillette? The best a man can get, indeed. Finally, and most excitingly, is Suavecito, which has skipped its way merrily to the top of my men’s haircare product charts (yeah, I have ’em). As well as a host of haircare products – more on which in a second – there is an absolutely incredible Black Flag inspired comb shirt, which I now decree as uniform for every barber I know. It’s brilliant. HairPomades is the exclusive European distributor for Suavecito, which is an interesting American brand. Like many of the best products, it was created by a barber and his friend (J-Bird, no less) and caught on through barbershop word-of-mouth – again, like so many of the best products. Investment came courtesy of the founder’s severance pay and now look at it! A cult phenomenon with a way-cool skeleton logo. You can find out more about them here. Like a Space NK for barbers, HairPomades gets the double thumbs-up from me for great products and even greater curation and design. If you’re a barber – or even a retailer, I imagine – you can find out more about being a reseller here. The lovely lady behind Hairpomades.com is a sweetheart! She sure seems like it from our correspondence!